Author’s note: I’m in the middle of moving, so I won’t be writing this week. I needed a break anyway. I’ll be back on Monday, December 18. In the meantime, this space will feature some past articles of note. Back when the Cold War was new, the great American newspaper man and Old Right seer Garet Garrett warned the people that they had made a great mistake and embarked on the road to suicide. 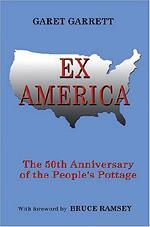 When his masterpiece The People’s Pottage was reprinted as Ex-America, a few years ago, I took the chance to share his great wisdom with my readers. Next Next post: And Was the Mission Accomplished?